The In-Eko Sand Separator is a piece of headworks equipment used to remove sand, glass, small rocks, egg shells, etc. that would normally enter the system. The problem with these items entering the system is that they can possibly damage pumps and other submerged equipment as well as having no organic value. 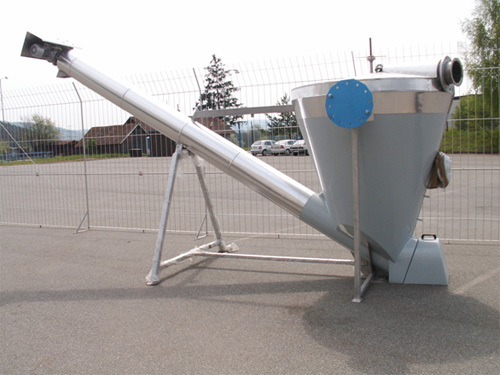 The separator is equipped with a dewatering screw conveyor to carry the sediment away. A screenings washing system is also available as well as insulated housings and heaters for cold climate applications. The separator achieves unparalleled separation capabilities due to its specially designed lamella-style plates and conical shape. Continuous adjustment of separation efficiency up to 1:10 allows for greater flexibility. Models available to handle flows up to 600,000 gpd. The In-Eko Sand Separator is another solution from Purestream ES, LLC that will help the overall bottom line of your project by providing a cost-effective and heavy-duty piece of equipment. The Separator also keeps down long term costs by using less connected horsepower as well as prolonging the life of downstream equipment.